WhatsApp is the most trending and common platform for information sharing like chatting, sending videos, audios, pictures, etc. It’s quite simple to exchange messages through a smartphone using WhatsApp application, to any person residing anywhere in the world. WhatsApp erased all the limitations for information sharing and set a new age record in offering the most inexpensive and simplest method to pass on the data either in the form of text, photo, video, contact number, location, and many other exciting features. Despite all the exclusive features, it’s a bit difficult to send large Video files through WhatsApp from your smartphone being Android or iPhone. We usually shoot lots of pictures and videos during a party or occasion, and a few of them may be substantial. We try to share them with our family and friends, but trouble arises in uploading. In a few cases, you record a high-quality HD video on your mobile, which is very large like even 40-50 sec video may be of 20-25MB. You can’t share this with your friends on WhatsApp. Size of the video matters here as it’s not possible to send video files larger than 16 MB. When you try to do this, you will be displayed a message on your phone screen saying “the media file you selected is larger than 16 MB. Can’t send this file”. A regular video on your Android smartphone for 6-8 minutes will be surely greater than 16 MB. Check out below image; I was trying to send 7: 55 – sec video to my friend which is of 17 MB. Here only a few portions of the video are selected by default, based on the size limit. If you click, send button just that portion of the video will be sent but not the full video. There are lot many ways to send large video files on WhatsApp; few may be using different applications, few may be reducing the video size and quality. 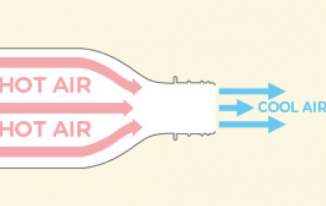 Choosing the best method depends upon your requirement and video sharing preference. 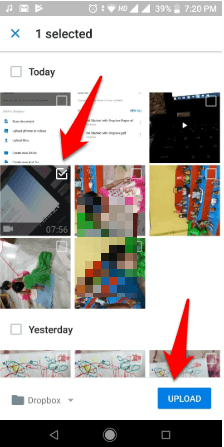 Let’s check out methods on “how to send large video file more than 16 MB using WhatsApp”. 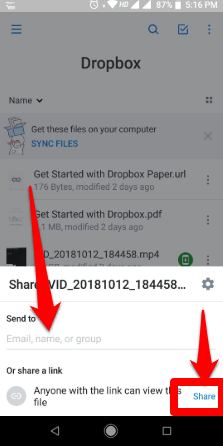 First download Dropbox from your Google play store, install it by syncing your Gmail account and give access to your phone contacts. Now open Dropbox app on your phone, on the Homepage click on the “+” symbol at the bottom right corner to add a video file to wanted to share. 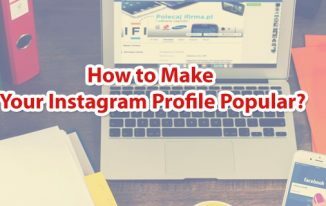 The from the pop-up screen, choose “Upload Photos or Videos.” You even have the option to select file directly from your computer too. Allow access to your phone media to continue video selection. Now choose the video file of larger size, you wanted to share to your friend and click on Upload button at bottom right corner. Your video is now getting upload on your Dropbox application. It takes a few minutes to upload the video based on the size. I am uploading almost 17 MB video. After uploading click on the three dots beside file name. From the pop-up, select share option. 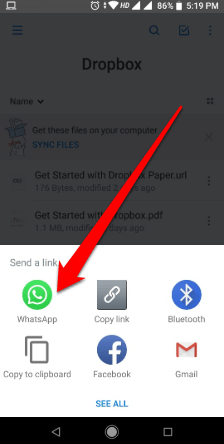 On the pop-up screen, click on “Create link” or “Share” in blue color, present at right bottom You can see a message displaying”anyone with this link can view this file.” Other you can also type email or name to share in different ways than WhatsApp. You will see creating link message on the screen and then directed to your WhatsApp contact list. Select the desired contact person, whom you intended to share the video and click send. You now shared Dropbox link of the large video with your friend. 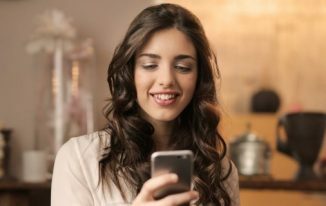 When the shared person opens the link, he/she will be able to download the large video file on their mobile phone or computer. Google Drive is every time a lifesaver to save your data, share any file or document without any loss of information in a most secure way. Every Android user will have Google drive account. Upload your large video file on to Google cloud storage and share the link with your WhatsApp contact. Follow the step by step process described below and start sharing your favorite videos to your contacts on WhatsApp without any size restrictions. Step 1 : The first thing to be done is to upload the desired video on your Google drive storage. You can do file uploading in two methods. 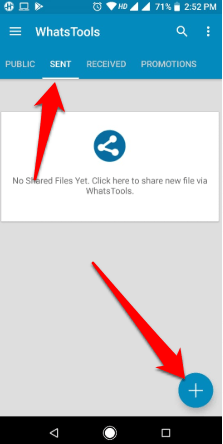 First way is to directly open your gallery or video files section and select share option. Then choose to save to drive option to upload the file to Google drive. Then click on the save button to save the file at a desired location on the drive. When you open your google drive you can find, your large video file uploading. 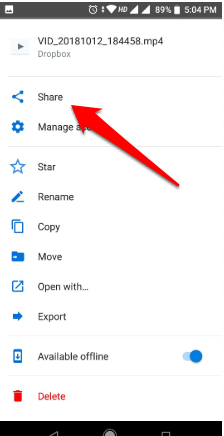 Another way is to upload a file by choosing from Google drive by selecting Blue “+” option on the right bottom corner. From the pop up choose “Upload” option and select your favorite video you wanted to share on WhatsApp. Step 2: Check google drive to find the uploaded file. Now long press on the uploaded video and choose “Copy the link” option to copy file path. Step 3: Open WhatsApp and select the contact you wanted to send your video. 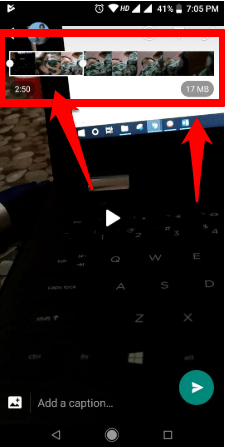 Now paste the copied video link in the message box and click send. 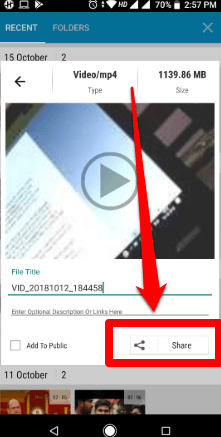 Now your large video file is shared to your loved ones in the form a link to google drive, and the viewer can download this to their own devices. You can imply the same technique to any other cloud storage platforms. Whats Tools is another app for Andriod phones, to send large video file without any hassle or low-quality issues. 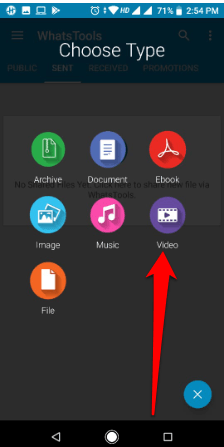 You can download Whats Tools App from play store to share video files of large size on WhatsApp. 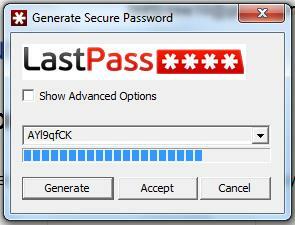 Step 1: After downloading, open Whats Tools app, and slide the screen. There you will find a “Get Started”button. Click on that to connect your Google Drive with Whats Tools app. Step 2: On the next screen, you find an easy way to connect with Google Drive. Click on “Click here to Sign-in” to proceed further. Step 3: Choose a Gmail account to get connected. 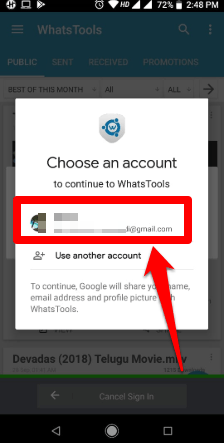 Whats Tools app will get linked to your Google account. Allow permissions to your Google Drive files and folders to complete the connection. Step 4: You can find the “Send” tab on the top of the screen, click on that to move to that screen. Choose “+” icon on the right bottom corner. Step 5: Choose the Video option to upload your favorite long video which you wanted to share on WhatsApp to your desired contact. Step 6: Select the required video from the list displayed, then press “Share” option present on the video tab. Step 7: You get a list of options to send your large video file via different app platforms. Options are various applications installed on your smartphone like WhatsApp, facebook messenger. Gmail, hangouts. Skype etc.. Choose “WhatsApp” option to share large video file to your interested contact. Step 8: Choose the WhatsApp contact and send the video. On the “Uploading” tab you can see, video uploading. If you want to stop uploading, you can pause the process. You can easily download “Amazon Drive” App from your iPhone App store and Google play store on your Android phone. 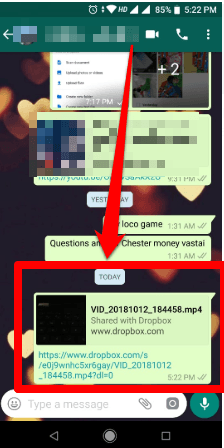 After installation, upload the video file you want to share and then share the link of the video to your WhatsApp contact. Amazon drive offers you free 5GB uploading and sharing data for videos, images, and audios. Hope you have gotten a lot many exciting and advantageous ideas on how to share large videos files on WhatsApp. Try any one the method mentioned above, to share your favorite video shoot with your friends. No more worries about video size and HD quality. 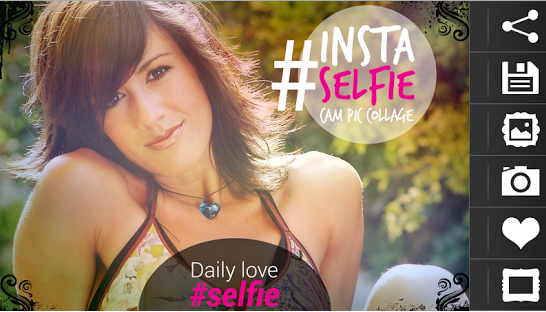 You can share any lengthy video and of any high picture quality without any disappointments. Cloud storage is a just a life saver.